Powering electric actuators when there's NO POWER! Battery Backup Solutions for unpleasant situations. That thunderstorm that threatened to douse you on the way to work takes out the power just as the next phase of production begins, but your process and equipment lines are protected because your critical valves have Power Backup Units with enough power to close (or open), EVEN IN A BLACKOUT. The PBU series of computer-grade UPS back-up systems designed for use with ProMation Engineering P Series electric industrial quarter-turn actuators provides the power necessary to drive actuators to a field selectable fail-safe position. Full customization is available to utilize with other actuation products. Typically, applications requiring fail-safe operation of actuated devices have had to rely on either the limited power of mechanical spring return actuators, or use costly high pressure pneumatic devices to provide fail-safe positioning. The Model PBU series is a battery back-up system designed for use with ProMation actuators and provides the power necessary to drive to a field selectable fail-safe position. Indicator lights visible through the front of the control cabinet give status indication of mains power, back-up system charging and failsafe operation. 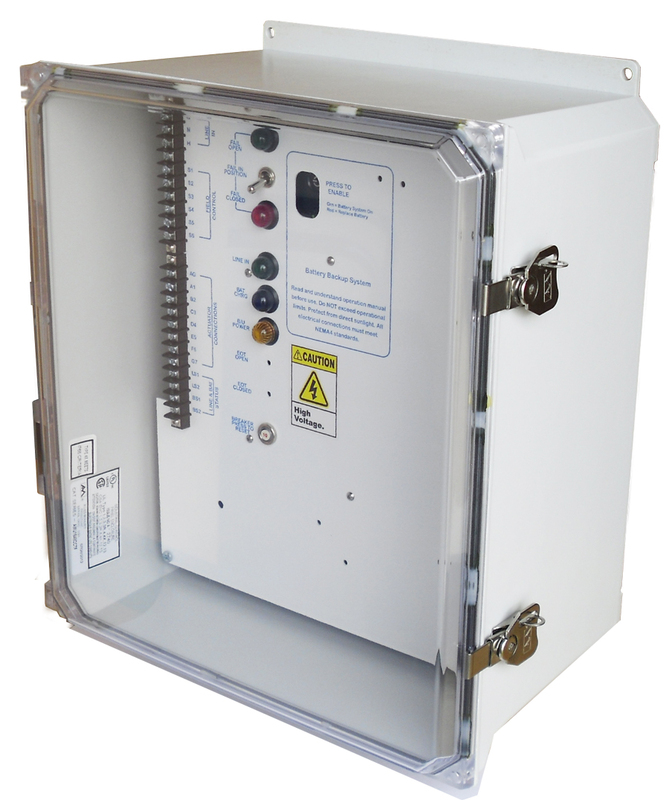 The PBU series is powered from building power, and all power and logic interface wiring passes through the control cabinet. * Not all products are available in all voltages.